Ever wondered why despite heavy water changes and chemical treatments your filter still performs? Read on. Ever wonder why after a good filter cleaning or maybe stupidly fast flow rates your filter. it still performs? Read on. Ever wonder why despite folks telling you treatments will ruin your biomass, Armageddon never materialises? Stay tuned the following will shed some well deserved illumination on just what a bio-film is, how it functions and why it performs the way it does. One of the most commonly misunderstood bacterial concepts is that of the bacterial bio-film. In our case it pertains to the microbes that build up in the koi pond and filter and are responsible for nitrogen conversion. A) Running the flow rate through your filters too fast the bacteria will be washed away or sheared off the media. B) A Chemical treatments added to the pond will totally ruin your filter bacteria. I am sure you will have heard many more comments like this. While some of this will certainly be true of very newly established filters, this is certainly not true of established filter bio-films. I am quite sure these types of comments are based on a “do no harm” philosophy and I certainly have no argument with that. However, such statements illustrate a lack of understanding of the concept of bacterial bio-films and the complexes that make up such a unique form of micro-ecosystem that has evolved specifically for the survival of bacteria in a hostile environment. I think it’s fair to say, most people's idea of a bio-film is: a continuous monolayer surface deposit of bacteria that can consist of both colonising and free swimming plank-tonic bacteria, easily washed off the surface. I suppose because most interested observers can simply waft silt deposits off appendages easily with the hand and therefore back into suspension, there is a tendency to imagine the bio-film must be pretty much the same. This could not be further from the truth. In actual fact established bio-films are an assemblage of microbial cells that are irreversible associated with one another that are not easily removed. Bacteria enclosed in a matrix of Polysaccharide material, thus allowing intercellular communication, growth and survival in a hostile environment. Ninety nine percent of all bacteria live/exist in a bio-film, this is no accident. Bacteria have evolved on the basis of “no bacteria is an island” or, “united we stand divided we fall” principal. With this in mind nearly all bacteria live with and depend on other strains and species of microorganisms to provide energy, carbon and nutrients. And all have to contribute to the bio-film matrix. A bio-film is characterized as a self-structured and self-produce polymeric, three dimensional matrix of bacteria living in a community of mutual benefit of one another (Micro ecosystem). Bacteria will adhere to just about any surface be it living or inanimate the latter would include plastic polymers right down to rocks, sand, clay’s and stones in a pond/river system. Bacteria not yet attached to a bio-film are know as plank-tonic *Loners* and will eventually transform to be part of a community when they becomes attached to a bio-film. 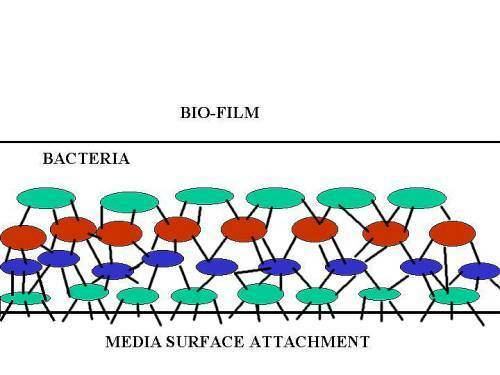 Bio-films are made up of sometimes hundreds of species of bacteria in one continual bio-film that can be multiple layers deep with multi species. These species in the bio-film not only depend on one another for nutrients and strength but also demonstrate cellular communication (a bio-film with intelligence). In the bio-film matrix there are microscopic water channels (voids) that serve to bring water rich nutrients and clear waste matter from the subsurface level microbes. Only the top couple of layers are reproducing/multiplying adding to the mass, while the lower levels stay in suspended reproductive stasis. So in short a bio-film has mass, it has depth, and it has structure and order. It further has strength and lots of it. The easy way to explain this is to give one of natures finest examples of bio-film that we should all be familiar with, Tooth Plaque. For all intents and purposes our perception of tooth plaque is a build up of calcified deposit on the enamel of teeth it certainly feels like that when the Dentist chips it away in a scrape and clean. It was discovered that plaque is in fact a semi-aquatic bio-film with a living structure encased in a semi solid matrix with surface bacteria multiplying and adding to the mass but with sub-surface bacteria contributing to the ecosystem and adding inner strength. Antonio Van Leeuwenhoek discovered the bio-film characteristics within tooth plaque with his simple microscope and was accredited with the discovery of the microbial bio-film. He further discovered that when these microbes where presented with a considerably better surface to adhere to, the number of microbes living in the bio-film were considerably greater than anything else found in the surrounding area's. In the last two decades, with the new age of scanning electron microscopes (SEM) and Confocal Laser scanning microscopes (CLSM), we have now been able to study bio-films and the mechanic's of how and why they attach to a given surface and how strong that attachment is and further how all these species interact with one another. In nature bio-films will form on just about anything from water pipes, clays and rocks to human organic material right through to contact lenses. An ulcer on a koi is also a bacterial bio-film. Obviously some environments and conditions are more favourable than other but its fair to say wherever bacteria exist a bio-film will also exist. Free-floating bacteria in the pond are single celled plank-tonic microbes with appendages called fimbraiae, (filament legs) it is these fimbraiae are responsible for the microbe’s ability to attach to a surface. Research has shown that faster flow rates show better adherence rates and plastic surfaces also can account for easier attachment, contrary to what you may think. 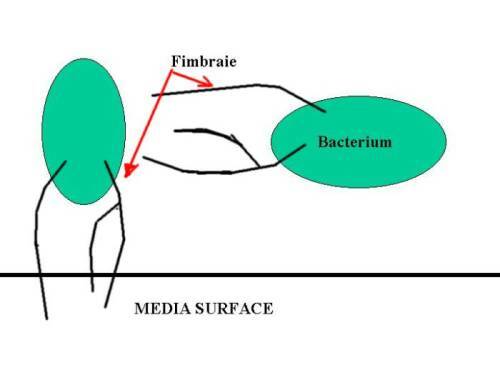 For example if we take our filter bacteria, once our nitrifying bacteria are present and have nestled next to a suitable surface, the fimbraiae will attach the microbes to the surface. This could be pond slime pond walls and submerged equipment or filter media. Once there, other microbes will join to this site creating a micro-colony. When these microbes have glued/attached themselves to this surface they are pretty indestructible, and removal is virtually impossible. Once the colony is established, the matrix could and would included, many, many, species, good and bad, not just the ones we want for bioconversion. These microbes begin producing “extra cellular polymeric substances" (EPS) or (slime). This consists of polysaccharides and water, and will further aid adhesion and creates a relatively impenetrable barrier that is not easily breached. As more and more, microbes join and are created on in the upper layers, a very complicated three-dimensional matrix is created. The bio-film matrix will have waterways (canals) through it just like passages, a kind of labyrinth. These water channels supply the lower strata's of the community with nutrients and will remove waste products. As the bio-film matures with age its metabolism will decompose the polysaccharides, this will produce a calcified deposit. Also in the bio-film will* be pathogenic bacteria so we will also have good and bad bacteria in the matrix that live in harmony. Upper level Bacteria can move in and out of the bio-film, but, the only time anything will really purposely move out of the bio-film, is when it is no longer contributing to the eco system. In such cases any redundant bacteria will be expelled out of the film to make way for another microbe that can contribute this may be one from the top layers it may even be one that moved *up* to fill the void. Scientific evidence shows that bio-films are relatively indestructible once formed and established. They is demonstrated by their high resistance to chemicals and mechanical forces. In many recycling applications even harsh chemicals or a power jet wash will not dislodge them. such industry with a need for complete bacterial removal will routinely employs shot blasting techniques for full bio-film removal. Ever wondered why your filter bounce right back after a harsh chemical treatment? Well not only is the bio-film highly resistant to chemical warfare so that even if you did manage to penetrate it you may only burn off the top layer. The untouched subsurface will then become the top layer and not only take over, but begin rigorous reproduction. It’s a bit like pealing an onion or like a plastic surgeons doing a face peel to expose fresh new cells. If you think about it logically, if what folks say about flow rates has any merit at all, with filter systems like bakki showers and fluid beds and alike you would never establish a bio-film the bakki shower would suffer from its powerful flow rates and the fluid bed because of its abrasiveness. Also consider a riverbed, one giant bio-film, doe's water speed influence this? Maybe, but not to the extent it impedes its function despite water going over rapids. If there is any doubt of this, try stepping on a stone in the rapids. You will quickly slip into the water on guess what? Municipal waste water systems have huge bio films that cope with torrents of water through them, and these systems ultimately rely totally on an efficient bio-film to recycle water. If bio-films were as flimsy as folks would have you believe then on the one hand this would be good news for us. All dentists the world over would be out of business, period! The bad news would be, we would have no renewable potable water source. Just think about a bio-film that despite brushing three times a day still cannot be totally removed and will eventually rot your teeth! That’s pretty indistinctive and impressive. Typical filter bio-films can even resist dehydration. After spending several weeks well dried out upon being re-submerged in water the bacteria pick up where they left off as though nothing had taken place. Think not? Well just do some internet searches on pathogenic bacteria; there are many studies of pathogenic bacteria being dried for several weeks, upon re-hydration become just as contagious as they were prior. I have a good friend who routinely takes his towers/showers out of commission for months at a time over the winter and allows them to dry out. As long as no attempt has been made to cleanse them in any way, they kick back into action as soon as they are pressed back into service. Currently much time and effort is being spent on the understanding of bacterial bio films especially in hotter poorer regions of the world where disease eradication is a problem. This is in order to develop drugs and chemicals that can take advantage of, any inherent weakness in the complex structure of the bio-film, in order that chemicals/drugs can indeed penetrate bio-films and destroy them. Take a moment to consider these aspects of the science with logic, then consider the evidence; you will come to see just how robust the bio-film is in real life. I hope this has helped explain the current miss information on filter bio-films and if you can now see just how indestructible they really are you have not only understood this paper fully. But, you will also have a better understanding of exactly what your chemical and cleaning protocols are not capable of.